Introducing The Period Party and of course your Good Food Friday Treat. The Period Party is what happens when you get three women’s health experts unscripted, uncensored, and on the air, chatting about all you ever wanted (and maybe didn’t want) to know about periods, fertility, and women’s health. Nat Kringoudis of Melbourne Natural Fertility, Nicole Jardim of The Healthy Elements and Elle Griffin of Happy Yogis bring laughter, love, and learning to all their favorite endocrine and reproductive topics. Think of it as girl talk gone menstrual! The Period Party will meet monthly to answer all those questions you wouldn’t even ask your gynecologist (unless of course she was your best friend). So snuggle up with a cup of tea and tune in to our latest episode for all the best in period fun! We’re thrilled to have you join us!It’s just SO exciting and we’re busting to get all the info to you that you want to know! The period party kicks off on July 24th at 3pm – we have our first live call in – where you can listen in and ask or email in your questions through. The girls are joining me from other corners of the world and of course, you can listen in at a time more convenient to you simply by downloading the recording from itunes. There will be more info about it in the lead up to the 24th so stay tuned! Now onto Good Food Friday! Arrange pumpkin wedges on a baking tray and drizzle coconut oil over the top. Season with salt and pepper and place in a moderate oven for approximately 45 minutes or until cooked and golden brown. Once cooked, remove and arrange on a serving dish. 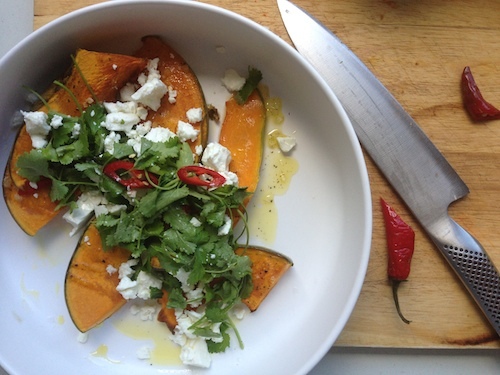 Place feta over pumpkin, as well as chopped coriander and chilli. Serve with your favourite protein source! Well my gyno is a man! And yes I ask him anything and everything! He is a professional! You should not be afraid to ask or tell your doctor anything. Pretty bad if you can’t. Hi Nat. I’d like to register but the link is broken. Is there another way to join? I think we are actually at capacity. But don’t fear – the live recording will be up tomorrow! !